If you are looking for a great gift for a weather pro in your life look no further. This unit monitors both your indoor and outdoor temperature. It also provides you with the daily highs and lows of your weather. These hi’s and lo’s are depicted with icons on your display screen. Humidity levels are captured for your health and comfort constantly being watched and reported to you as well. This is reported on your display with an icon too. This sensor unit will provide the following weather indicators to you. The 02064 features wireless transmission between the remote sensor and the display unit inside your home. The transmission should do really well in an up to 330 feet (100 meters)distance between the two. You need to read these really informative articles on mounting your weather station and the correct things to do and know can be found here. The 02064 has a self-learning calibrating program as a programming feature. It will constantly be doing and updating a 12 to 24-hour Weather forecast for you. It will use icons on the display screen depicting the following weather conditions for you. It will show you sunny; partly cloudy; cloudy; rain; snow and rain/snow mix. Many people find this to be a highly popular feature. The last interesting hi-light would be the color screen which can be dimmed or brightened. It can be seen well at night, yet isn’t too bright to keep you and the family awake because of it’s brightness. Q What is the size of the display unit? Q Does a power cord come with the unit? Q Can I use this with out a pc and will is save data like year to date rainfall? A. The display will save some data for a period of time. But it would be a good idea to download data to your computer so as to store data for long term use. No computer required other than setting up your account. Q How often does it update the wind speed? Q Does the rain gauge self empty as with other models AcuRite offer? A Yes, it does self empty. Q Do you have to have Wi-Fi to work this device? A. You need Wi-Fi if you want to keep a log. Q Is the clock atomic? A. The clock is not atomic. You will need to reset time changes on your own. Easy instructions are provided. These are the areas that the AcuRite 02064 will provide as recorded weather instrumentation for you. Please know as well that the AcuRite Connect is installed and ready for use as soon as you get everything set up with your sensor and it’s signal to your in home main display unit. The illuminated color display is one of the main attractions of this model to customers. So Let’s talk about how it works for you. This weather station’s color display features three different lighting settings. They are: high which is (100%) brightness, then you have the medium which is at (60%) brightness. Then your third choice is the low (15%) brightness setting. Some other things that you should know are, using battery power alone, the backlight is available momentarily for 10 seconds. When the display is powered with the power adapter, the backlight will remain on at full 100% brightness. There are directions that you can adjust your brightness settings to your own preferences. Then please be aware of the Auto Dim Mode which automatically adjusts display brightness based on time of day. ✅ It displays the famous Weather Ticker™ which streams real-time information and alerts towards the bottom of the display screen. ❌ The connection to your PC is not provided. You can purchase as a separate purchase The Bridge, which will allow you to do many connections with your personal computer. ❌ Some customers have noted some transmission problems with downloading information to weather data collection sites like Weather Underground. In this exhaustive look at this model from AcuRite, I have found that this is a step up, weather station for you. This is on the way from a primitive, simplistic under $50 dollars beginnings station to getting a more professional grade weather collection station. What this is, is a great gift or personal purchase for the more weather interested person. It gives you much more information to digest and keep track of. So if you are a weather geek, it is time to go for the weather station you have been dreaming of for a long time. The customers have reviewed at over 4 stars, and I am reviewing it at a 4.3 star rating as well. It has all the readings, and is versatile with the weather collection information to give you hours of weather analysis. You now are also able to hook up with a data collection site. Another step further into doing your own forecasts. Great Guns! A great product to seriously consider. This review article is a look at the AcuRite 01512 Pro Color Weather Station. Most manufacturers build a series of stations that are very similar to each other. 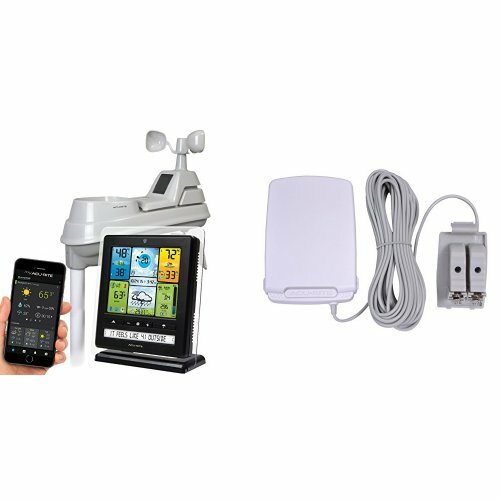 The AcuRite 01036 Pro Weather Station is a standard in the complete line of AcuRite professional weather instrument gathering stations. I have completed a thorough review of this personal weather station for you. AcuRite's professional digital weather station with AcuRite Connect acts as your virtual weather station, allowing you to remotely monitor your weather from nearly anywhere on the planet. Setup is easy! Simply place the 5-in-1 sensor outside to begin measuring your outdoor temperature, humidity, wind and rain. The sensor wirelessly sends your weather data to an indoor display for quick access to your information. - A Weather Ticker that flashes real-time environmental information and alerts. The best part? The AcuRite connect feature allows you to view your weather information remotely via the internet or a smartphone. Simply plug the indoor display into a computer or laptop. AcuRite Connect can send your data to the AcuRite software, app, or Weather Underground. Become the trusted local source for weather information with AcuRite's Pro Weather Station with AcuRite Connect.